Kids and animals. Now Chaplin has worked with both. 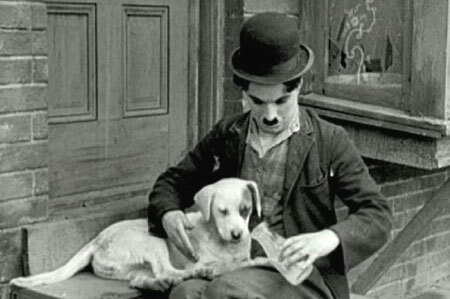 In A DOG’S LIFE, writer-director Charlie Chaplin makes a tenuous link between a female mutt fending for herself on the streets and his Little Tramp character fending for himself on the streets. As always, a Chaplin film filled with milky, creamy goodness. Tramp befriends Scraps And that’s about all there is to the metaphor. She’s just his pet for the duration of the short; no more bearing on plot or analogies. She does dig up a wallet stolen by a couple of thieves, which Tramp seizes as his own – until the real thieves thieve it back. Tramp also befriends a men’s club “entertainer” (Edna Purviance), a woman who is terrorized by her boss to pull in more customers by winking and promising them clothed dances; Tramp will eventually waddle into the sunset with her. Starring: Charles Chaplin, Dave Anderson, Albert Austin, Henry Bergman, Minnie Chaplin, Syd Chaplin, Edna Purviance.